This sketch demonstrates more .obj file support for Processing.js. This blog post is the continuation of a series of blogs [1, 2, 3] related to adding .obj file support to Processing.js. This code I’m working on is important since it will allow developers to easily load 3D models from files and it will increase the performance of rendering 3D objects in Processing.js. Since my last blog, I have added some small but critical changes to the code, some of which I outline here. The sketch below is a simple example of using Saito’s .obj extension, which my code expected. The problem was that I had no idea what loading 3D models was supposed to look like natively. So I asked Andréas for a simple sketch that worked in Processing and that I could emulate in Processing.js. After receiving the sketch, I was glad to see it wasn’t much different. 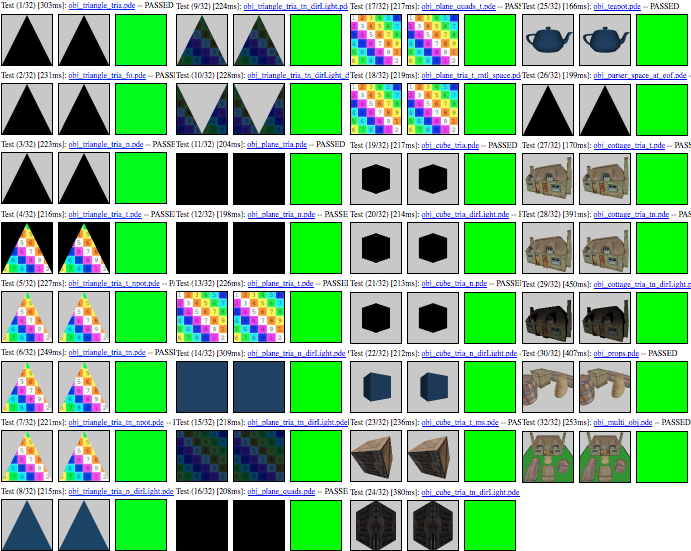 I found that many 3D authoring tools export .obj models with triangle fans. In my last blog about .obj importing I wrote about the lack of support in my code for this scenario, but I recently wrote a patch that fixes the issue. It was not difficult to write, but because of this fix, many more models can now be properly parsed. This includes the 3D model at the top of this post. I found a few more issues with the parser so I fixed them and added reference tests. I’m finding these tests invaluable since I’m often tweaking the parser as I go. I have just over 30 right now, but I hope to have many more since I expect the code will go through many more transformations. If you are using my ‘extension’ and you find a file that isn’t being properly loaded, please send me your file so that I can fix it and add a test.